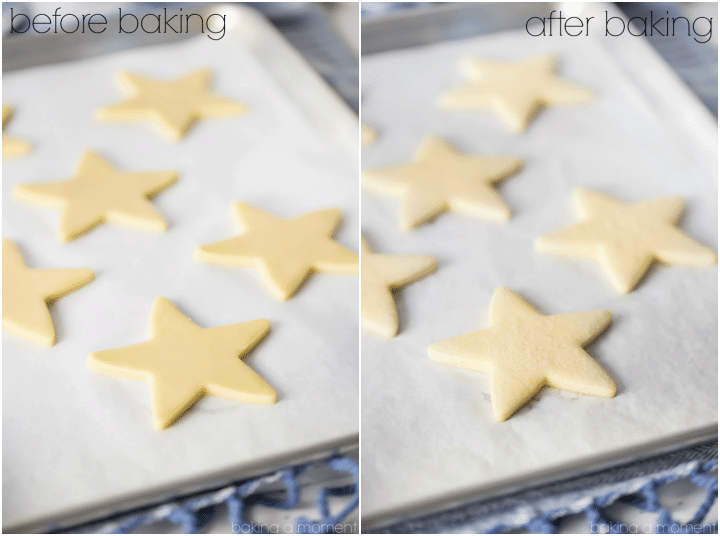 Learn the secrets to baking cutout cookies with neat edges, that won’t spread as they bake! You’ll fall in love with baking and decorating cutout cookies. **This post for cutout cookies with neat edges originally appeared on my old blog, YinMom YangMom, and has now been updated with the above video, as well as brand-new, pretty pics! Almost every baking blog I visit has a post or a FAQ devoted to the subject, “How do you bake cutout cookies that don’t spread all over the place in the oven, hold their pretty shape, and have nice, neat edges?? ?” It was not too long ago that I was myself searching for the answer to this age-old cutout cookie question. And when I want something, I do not rest until I’ve nailed it! After much research, and much experimentation, I’ve decided to put everything I’ve learned on this subject into one comprehensive post. I do realize that after reading this post, there is a very good chance that your cutout cookies will now be as pretty, if not even PRETTIER, than mine. But I have learned SO much from the many talented baker/bloggers out there, and they’ve given so generously! It’s because of them that I’ve been able to build this hobby that I’m so fulfilled by! It simply would not be fair for me to keep this stuff to myself. It’s too good! And what’s the point of a site like this anyway, if not to inspire??? I developed this cutout cookie recipe myself, but based it on a few of my favorite cookie bloggers’ recipes. The changes/tweaks/modifications I’ve made to their formulas produce cutout cookies that are kinda soft, but a little crunchier around the edges, with a mouthfeel somewhere between a sugar cookie and a shortbread. Scroll all the way to the bottom of this post, for my basic vanilla recipe. Don’t Bother Softening the Butter: I like to use cold, cubed butter when I make the dough. Two reasons: 1) I’m lazy, and impatient, and I don’t always plan ahead. I don’t want to wait for the extra step of softening the butter. When that cookie baking urge strikes, I just want to go for it! 2) It also saves the step of chilling the dough before baking, which is another trick a lot of bakers use to help their cookies keep their shape. If you work quickly, the butter is still pretty cold when it goes into the oven, so the dough holds its shape better and doesn’t get all melty and slide all over the baking sheet. Leave Out the Leavening: Now, you may notice that my recipe contains no leavening of any kind. If you think about the purpose of baking powder in a recipe, it’s to help things puff up and spread out (hello!? ), and be light and fluffy. Light and fluffy is great in a muffin or a pancake, but we are talking cookies, here, people. They are meant to have a little bite to them. Perhaps they are a little bit heavier, but in this instance, you kinda want that. Odds are, you are either shipping your cookies or delivering them by car, and if they are too light and delicate, they’re more likely to break. So, this is going to give you a more durable cookie, and I promise you, they are still every bit as delicious. The Magic Ingredient: This is the biggest key to the whole business, and maybe the only thing that you won’t find on any other blog out there (that I’ve seen, anyway). THE CORNSTARCH. It’s pure witchcraft. I discovered it totally by accident, when searching for a way to make my gluten-free cookies less grainy and sandy textured. I had read that cornstarch can give shortbread a “meltaway” texture, and I thought I’d give it a go in my GF flour mix. It really does help, incidentally, but I also noticed that it made the dough SUCH a pleasure to work with! It is NOT sticky at all, nor is it crumbly. It just stays right where you want it. And those edges! I about died…! SO clean and perfect! Now I use it in every kind of batch, in every flavor. I just can’t live without it. Try it, you’ll see! Just sub out a little of the flour for cornstarch, in any recipe. It’s like magic! Make Parchment Your Bestie: Also, definitely try rolling your dough between two layers of parchment paper. It is absolutely no-muss no-fuss! Between the silky, UNcrumbly texture of this dough, and the parchment thing, I barely even need to wipe my countertops after making these cookies! **No bench flour! ** (Which, by the way, can also make a tougher, less tender cookie.) I also line my baking sheets with it, and besides keeping things from sticking, it keeps the pans cleaner too! My cookies bake on parchment, and then I lay them on the same sheets to dry after decorating, so each sheet gets double duty. Here are the baking sheets I use, and here is where I order my parchment. Crank Up the Oven Temperature: Finally, you may notice that I recommend baking the cookies at a higher temperature, for a shorter time. This allows the cookie to “set up” more quickly, and hold it’s shape during baking, so again, less melty-slidey. I hope these tips and tricks inspire you to get out your mixer and create some beautiful holiday cookies. Honestly, there was a time when I felt daunted by the idea, but thanks to a lot of inspiration from the talented ladies I mentioned above, and now that I’ve worked out my recipe and this system, it’s totally painless! Do you like to bake and decorate cookies at this time of year? What is your favorite kind to make? Have you struggled with too-spread-out cookies and sloppy edges? Do you have any sanity-saving tricks to make it easier? Please share! I also have a chocolate cutout cookie recipe, that’s every bit as good as this one, if not even better! And a gingerbread one! Now be sure to grab my favorite royal icing recipe– it’s the perfect way to decorate your cutout cookies. For even more great cookie recipes, be sure to follow my “Cookie Recipes Galore” Pinterest Board! Mix in the eggs until incorporated. Add the flour**, cornstarch, and salt, and mix on medium low speed. The mixture will seem very dry and sandy at first, but after 3 to 5 minutes in the mixer it will gather itself into a ball and pull away cleanly from the sides of the bowl. Cut into shapes, and bake for 9 to 12 minutes (for appox. 2 1/2 inch cookie). Cool completely, then decorate with royal icing. **If you live in a very dry environment, or if you don't have a very powerful mixer, you may not need all the flour. Add about 1/2 cup at a time, and stop adding when the dough gathers itself into a ball and pulls cleanly away from the sides of the bowl. Great post. Thanks for sharing your recipe and tips. I have made all the recipes you mention but Katrina’s. And, playing with flavor combinations is a must. If/when it is strictly vanilla it has to be vanilla bean paste — love those flecks! I look forward to putting your recipe to the test this week to compare to my own that also includes a bit of cornstarch because I cannot resist that shortbread meltaway texture. Hey Marley! Sorry for the late reply. This dough does not need to be refrigerated. It’s one of the things I love about it! Hi does this biscuit stay crispy. I am looking to make a cake box out of biscuit is this recipe good enough for that I was hoping to get the box prepared ready for the Christmas cake to go in. Hey Carol! What a fun idea! I would say it’s more of a tender texture than crispy. It’s a bit like a sturdy shortbread. Not quite as crumbly though. It’s sturdy but not really crisp. I hope that helps! Good luck with your cake box! I loved that this recipe used vanilla bean paste and the cornstarch made the dough great and easy to work with. The only problem I had was my cookie still had a slight dough/flour taste to it, any suggestions or tips to prevent that? Hey Chelsea! I think if you baked them just a little bit longer, you might like the taste better. The texture could be a little more crunchy, but it would probably cook the “raw” flour taste out more. Hope that’s helpful! Thanks for your reply, it did help to bake them a little longer and I also modified a little using only 3 cups of flour and a 1/2 teaspoon more of vanilla bean paste. Thank you so much for your recipe, I was always scared to make cookies from scratch cause I could never find a good recipe and now I have (: my cookies came out great and even better with the icing, my family loved it and I’m excited to show it off at my daughters 1st birthday party ! I’m so happy they worked out for you! Don’t you think the icing is so necessary? Happy birthday to your little one! I see Chelsea mentioned she used 3 cups of flour instead of 4…I had the same experience when I first used the recipe today..Will the 3 cups still be ok? Hey Stacy! If you’re using a hand mixer rather than a stand mixer, it’s not as easy to get all 4 cups of flour incorporated. You can either knead the last bit in by hand or just use a little less. As long as your dough has gathered itself into a ball and doesn’t feel sticky, it should be just fine! Love this post! Who would’ve thought, hun? Great advice. I am not much of a baker but this post makes me want to bake some cookies, lots of them! Do you have your frosting recipe\tips anywhere? I’d love to get the glassy smooth surface you’ve achieved! Hey Crystal! I learned a lot about how to decorate wtih royal icing from http://www.sweetsugarbelle.com/ & http://sweetopia.net. They have excellent recipes and really great tutorials too. I’ve found that it’s all about the consistency of the icing. Too thick, and it won’t lay smooth, too thin, and it runs off the cookie. I thin it out with just a drop of water at a time, until it’s just right. Definitely check out those tutorials, and it’ll all make sense. Good luck! Excited to try this recipe! Where can I find the chocolate version!!?? Thanks! I’m such a bad blogger, Teresa! I know, I should have a dedicated post for the chocolate version, it’s so easy to work with and the taste is like whoa… I do have it on the site, but it’s kinda hidden. It’s within this post: https://bakingamoment.com/chocolate-mint-cookie-bars/. I used it as the base for these bars, but it’s actually my go-to chocolate cut-out cookie recipe, minus the chocolate chips. I hope you enjoy it as much as I do! I had found the link to LilaLoa: End-All for Chocolate Cookies-but will check out the one you just linked as well. I will vouch for Lila Loa’s End All Chocolate Cut Outs (and her Vanilla, too), but I will try the adaption you’ve posted here. Thanks for sharing. My pleasure, Laura! I hope you enjoy! ok, one more question now that I have my mixer out and all the supplies waiting- How many does this recipe make? trying to decide if I want to double it. Also, if I want to add a little flavoring to the cookie mix what stage would I do that? Does it matter? So I just made the chocolate recipe (the bar recipe you linked), and it turned out to something more like crumbly sand? I could see how it could be pressed into a bottom of a pan- but not sure how it would even be able to be rolled out for cookies. Any ideas on how to fix? My dough came out crumbly too but I put it on my stand mixer with the paddle and I added water a teaspoon at a time and it came together nicely. Great recipe! I’m so glad it all worked out! Thanks so much for reading and trying one of my favorite recipes! Hi, just wondering the weight of 2 sticks of butter in grams. In Australia we get butter in 250gm packs. Aw, I’m so glad to hear that! Scalloped hearts sound adorable and your little ones are so blessed! Thanks so much for reading and for the sweet comment. Happy baking! They turned out perfect!! Thank you again!! delicious. And obviously, thanks on your effort! Hi Allie thank you so much for this recipe, this is just what i was looking for!! 🙂 I just have one question, i was wanting to make strawberry flavored cookies and just wanted to know do i just substitute the stawberry extract for the vanilla bean paste and leave in the vanillla extract as a base or do i leave out the vanilla flavor all together? Also if im using multiple flavors in abatch about how much of each should i put in? Thank you for all of your tips, they are extremely helpful. THANK YOU THANK YOU THANK YOU for this recipe. The cookies I made were perfect. Exactly what I have been looking for!!! Thank YOU for the awesome feedback! I’m so happy they worked out so well for you 😉 Hope to see you here again soon! Thank you so much for posting this recipe! Making Hello Kitty shaped cookies for my daughter’s birthday and had tried a few others first with no success and was about to give up when I found yours. Now I have perfectly shaped Kitty heads :). Thank you thank you! Oh, yay! I’m so happy you finally found success! Thank you so much for reading and for the awesome feedback. Happy birthday to your daughter! Hey Cassie! I don’t think I have a gingerbread recipe on my site; however, I would certainly try using one that you like and just omitting the baking powder. I think it would probably make a big difference! Let me know how it all works out, ok? I really love your cookies and I would like to bake them. Could you help me with translating the ingredients in cups to gramms? Thank you in advance. Thanks Agnes! If you google “cups to grams,” you should come up with several helpful articles. Here’s the top result: http://allrecipes.com/howto/cup-to-gram-conversions/. Hope that helps! Hey Kelly! They last a really long time; I’d say a month at room temperature, and indefinitely in the freezer. Thanks for reading and I hope you enjoy! Hi! I am a (less than) novice cookie baker. My daughter’s birthday is in a month and I want to make the cookies now and decorate later. If I store them at room temperature, should I place wax paper or something in between them? I just found your site and I am so excited to try all your recipes!! Hey Melissa! I’m so excited you’re going to love this recipe. If you’re making them a month ahead you might want to think about freezing them. Just place them in an airtight container (wax paper in between might be a good idea) and keep them in the freezer until the night before you’re ready to decorate. Good luck & happy birthday to your daughter! Thanks Sandy! You’re going to want to use the cornstarch in addition to the flour. Good luck and I hope you enjoy! I am beyond excited about this recipe! Thanks for doing all the leg work. I am going to make these tomorrow but just wanted to say thanks. I love baking but have never attempted cutout sugar cookies but can’t wait to use this recipe with my new Jack-o-lantern cookie cutters! Yay! I’m so happy you’re going to try this recipe- I think you will really love it! It’s so good with royal icing. Thank you so much for reaching out and I hope you enjoy, Jessica! Okay. I tried your recipe. I love that you start with cold butter. I am never prepared enough to use soften my butter. They are sooo tasty! I love shortbread, so I love the flavor. I used almond extract instead of vanilla (I love almond). I am excited to try royal icing on them. I have to say mine was a bit crumbly though. Thoughts? I’m so glad you enjoyed the recipe, Dacia! That’s kinda strange that it was crumbly though… I’ve never had mine come out crumbly. One thing I’d definitely suggest is to add the flour slowly, you may not need all of it. Also, if the dough sits for a while it does tend to dry out a little, so bear that in mind and plan accordingly. Hope that helps! Good point! I’ll try less flour! I can’t wait to try this!! Now if I can only figure out how to decorate them. Not sure what I have done wrong, followed to a T and it is super dry, only thing I can think of is I doubled the recipe…. This recipe looks soo good! I was wondering how I would make the dough without a mixer? I only have an electric hand beater but it does have a dough mixer attachment. I would definitely use that Clare. The dough is just about as stiff as any other cookie dough so if that’s what you normally use for cookie baking, it should work just fine. Good luck and enjoy! Aw, yay! I hope they work out well Amber! Thanks so much for stopping by! Got everything out to try your recipe before Saturday, when I have a bunch of kids over to bake, and noticed that it requires unsalted butter. I only have salted on hand. Do you think if I eliminate the salt requirement and use the salted butter I will get the correct result? I think you’ll be just fine, Michele! Thanks so much for reading and I hope you and the kids all enjoy! This is such a great recipe! It’s my “go to” cut out cookie now! I’ll be making the chocolate version today! I really wish I liked royal icing, but I started using melted colored chocolate chips to decorate with . . . yummy! I love your blog, thanks for all the fabulous recipes! Thank you so much Karen! Melted chocolate sounds like such a delicious way to decorate cookies. I don’t always love royal either, in fact I’ve tried to modify the cookie recipe to compensate for the sugary-sweetness of it. I’m so happy you were pleased with the recipe and thank you so much for the great feedback! This recipe is PERFECT for cookie cutting, the edges were so crisp with no spreading whatsoever! They were a little dense but the taste is great and I’m excited to decorate with royal icing tonight. I did underbake them just a minute or two (about 10 mins instead of 12) and they’re soft all the way through with a very lightly browned bottom. Thank you so much for finally posting a great sugar cookie cut out recipe that actually works! I am definitely trying this because I’m always curious about cutout recipes! but what I REALLY want to know is what your GF recipe is!!! I have a friend that’s begging for gluten free cutouts and I am overwhelmed with the amount of different recipes online!!! Oh, gosh Kindred Cottage you know I’m not sure I ever perfected that recipe fully! I do remember that I was using the King Arthur Flour brand of Gluten Free Flour blend, and of course the cornstarch really helped to “lighten” the texture. Beyond that I really couldn’t say. It was a while ago that I posted this (2 or 3 years now I think?) but I should probably revisit it, huh? Thanks so much for reading and for the great question! thanks for the answer AND the King Arthur flour info. I had no idea they had a gluten free flour mix, cool! I’m gonna try it if my friend okay’s it. I have a ton of different gluten free “flours” and “meals”, but for specific recipes and I was def getting a little lost with coming up with the cutout recipe. thanks so much for the inspiration! I’ve only taken up baking again lately, so it’s good to get advice from you gals that have more experience trying out trillions of recipes before me! ha! Well I’m so glad we found each other! I don’t know about the Superwoman part, but I do try to keep on top of comments as best I can. So- I liked the KAF GF flour because it had a nice neutral flavor, but I did find it to be a little bit on the gritty side. I don’t know a whole lot about GF baking but I feel like I’ve read about things you can add to offset that (?). Maybe your friend can steer you in the right direction; it sounds like maybe you already have something in your cupboard! Good luck and thank you so much for reading! OMG! OMG! This recipe saved my life tonight. I had to make paint pallete shaped cookies for a birthday party and I had complications like you would not believe! I came across your recipe. TRIED IT, LOVED IT, SUBSCRIBING NOW! thanks girl! Hello! Love your page. I’ve been trawling the internet to try and find some help and advice and recipes that I can use to make some biscuits and cakes for my friend as her twin daughters are turning 6, one of them has a wheat/gluten allergy. I have baked for years but have never baked gluten free! She wants me to make chocolate cakes, cupcakes and biscuits shaped like teddy. You mentioned in your write up about a gluten free recipe and using cornflour to stop the sandy texture, where can I find this recipe? I need help to get this right without having to bake so many trials runs! Hope you can help! Hey Vivvy! Thanks so much for stopping by and for the great question. Truthfully, I’m not much of an expert when it comes to gluten-free baking. I never did completely perfect that recipe I mentioned, at least not well enough that I wanted to post it. It was ok but not great. But if you don’t mind clicking back over to the post and having a look at the comments section, someone just a few days ago asked the same question, and there is a pretty in-depth explanation there. I hope you find it helpful! Good luck! I’m so excited to try these tomorrow for my daughters birthday. However, I forgot the parchment paper.. Are they possible without? If so, should I spray the baking sheet or no? Thanks! So I ended up at the store and I got some parchment paper. The cookies turned out fantastic! I do not have a paddle and just used my beaters.. They tended to dough up, so I finally just finished mixing them by hand. They turned out great. Thank you! Hey Terri! They are definitely possible without- I just find them so much easier with. I don’t think you will need to spray the baking sheet, there’s plenty of butter in the cookies already to keep them from sticking. Good luck and enjoy! Oh, great! I like the flavor and LOVE the shape of the cookies, but the dry texture out of the oven is daunting! I was already thinking up ways to correct the dryness, but I’ll hold off until tomorrow for “final judgement.” Best thing about them to me? No spreading means I can load up the trays and spend less time in my hot kitchen. Yes! I totally hear you on that one. I hope you enjoy them and you know- if they seem a little dry, maybe next time try decreasing the bake time by a few minutes. Good luck and thanks for reading! I can’t wait – I’m going to try your recipe tonight! But just a suggestion for people who complain about dry cookies – how you measure your flour is so important! You can’t pack the flour down or just scoop it out of the bag because you will end up with seriuously more flour than you want or think you’re measuring! I always fluff up my flour by using a spoon or smaller measuring cup and gently place it in the measuring cup and then level it off. That’s the only way to be sure you aren’t over-flouring. And never, ever tap the measuring cup on the counter – it just packs down the flour more! It bothers me when I see people rate a recipe low because the outcome was “dry” and it’s just that they don’t know how to correctly measure flour! Sorry to be on a soapbox! Oh not at all Carol! I actually really appreciate your comment. And you are so right- there really is a lot to the way you measure. I always measure exactly the same way. Thank you for sharing this useful info! Hi, I tried your recipe but the dough was dry and crumbly. I don’t have a stand mixer. I did try with my hand held mixer but the dough just wouldn’t come together. I added more butter and that seemed to do the trick. I’m going to try again tomorrow. I love that they don’t spread and I’m planning to do these for a party this weekend. Fingers crossed that I don’t struggle with the dough again! The dough does tend to be on the stiff side, and I think different brands of cocoa or butter could make a quite a bit of difference. Some cocoa’s have a higher fat content than others and the same goes for butter. If you run into that problem again, a few drops of heavy cream can bring it right together. Just be sure not to overdo it because then you’re back to spread city. Good luck Marie! have a question that I would love to know your thoughts on! I made your/this cut-out recipe (NOT gluten free as I asked about before) for some baby shower cookies. I LOVE the texture of these cookies!!! They were great tasting and they really do have that shortbread “feel” that I enjoy so much. I was really surprised by that cornstarch difference. They tasted so much lighter than my regular cut-outs. I made them a tad bit thicker than 1/4″, but I wondered, do you think I can go even thinner? Oh yeah, absolutely! I have done them even as thin as 1/8″ and they turn out great! But you are absolutely right- you just want to adjust the bake time. I’m so glad that you’re happy with the recipe! how would you flavor these to make them with a lemon flavor? would you use tsp of vanilla extract with a tsp lemon extract? would you use tsp of lemon ext. with a tsp lemon emulsion? just 2 tsp’s emulsion OR extract? and what about lemon zest? that sounds like it would just make it have such a freshness to them! I don’t want them over the top lemony! I do flavor my royal icing with lemon, but the taste often fades with a vanilla cookie, so I was thinking about trying lemon in SOME way or form. . . just curious as to how you might try it! I’ve done it with lemon zest and it’s very good! I don’t have emulsion and I’ve only recently acquired a bottle of lemon extract, but I’m sure either of those would work really well too! It’s purely up to you how lemony you’d like them to be. Adding more or less extract won’t really affect the chemistry of the recipe, so feel free to flavor according to your taste 😉 Good luck! THANK YOU!!! oh. my. word. I love them with the lemon taste! I used 1tsp of lemon extract, lemon emulsion, and 1tsp vanilla. I put probably about tsp? of lemon zest. different kind of texture, didn’t really taste it though. probably didn’t use enough. in one batch I even added about 1T fresh lemon juice just to see if I could get “too” lemony, LOVED that one too!!! but I have to say, i truly love love love what cornstarch does to this recipe! my cookies just seemed to become ROCKS after a few days if left out. these DONT. they just keep that wonderful shortbread-like texture!! I love Hanielas recipe and that is what I always leaned on, but your recipe is nearly the same as hers and that cornstarch did it baby!!! FINALLY! a go to cookie recipe that never fails! and it’s funny to me that they REALLY come into their best taste the next day!! I’m sooo glad I found you! now I’m off to decorate 2doz baby girl cookies with my GORGEOUS lemon cookies!!! Aw, I’m so happy you’re pleased! Thank you so much for the great feedback. Have fun and enjoy! These cookies worked beautifully! I was amazed at how perfect the cookie was when it came out of the oven! I softened the butter, but the dough was still easy to work with in my super hot East Texas kitchen. I used a bit of cornstarch to keep the dough from sticking (a trick I learned from making alfajores) and the cookies were easy to get off the counter and onto a baking sheet. I popped each sheet of cookies into the freezer for a couple of minutes because it was SO hot the day I made them. They looked exactly like the cutouts when they came out of the oven after baking. That’s wonderful! I’m so happy you enjoyed the recipe. And thanks so much for sharing all your tips and experience here! So, I’m reading this, and you talk about making a gluten free cookie, but I don’t see the recipe for that? Are you just subbing GF flour in place of the reg flour in the recipe? Hi Pamela! I did mention a gluten-free cookie but this is not that same recipe. But you certainly could sub GF flour and I bet it would be delicious! Thanks so much for reading and I hope you give this recipe a try! While these cookies baked beautifully with the neat edges like you said, I did not favor the texture or taste of the cookie after. My better half loved it and couldnt tell the difference; with the cornstarch I guess i expected it to be a mexican wedding cookie with a hint of butter but the cornstarch flavor was just too much for me. I even added less than the 3/4 cup yu specified and 4 vanilla beans. I will agree that these come out exactly outlined as is! Hey Shirley! I’m glad your better half loved the cookies, and so sorry you did not! These are definitely not meant to taste like a nutty Mexican wedding cookie, but rather, more of a shortbread/sugar cookie that is cut out with cookie cutters and decorated with royal icing. The cornstarch should not really give any flavor at all. It’s meant to behave just like flour but with a softer, finer texture and no gluten to make things tough. Was it definitely cornstarch (white powder) that you used, and not corn meal (yellow and gritty)? Either way I’m sorry you weren’t happy with the result! I actually think that this recipe, along with MANY other sugar cookie recipes actually taste better the next day, even a couple of days later. I don’t know why except everything just seems to settle down a bit? lol I guess that would mean mine were excited when they came out of the oven. . .hmmm, that could have just been me too. ? Totally agree! I think the flavors just have a chance to get comfy with each other, and everything just sorta matures. Thanks so much Kindred Cottage! I know I have read a comment similar before but scrolling through the comments I couldn’t find it. I have made several batches of this recipe. I love it! The consistency of the cookie and the edges are great! However, today I made a batch. I used the same brands as I have in the past and followed the recipe exactly but today’s batch is crumbly. I can’t get it to stick together. Is there something I can add? The only thing different from normal is that the weather is extremely warm compared to when I normally bake these. Could that have anything to do with it? Thanks! Hey Kim! I’m so sorry you’ve had trouble this time around. I definitely think that weather can affect these cookies- maybe it was the heat or maybe the humidity was especially low? Another thing I’ve noticed is that if the dough sits for a while before you roll it out, it can become dry. Obviously the best thing to do is to add the flour just a little bit at a time, and keep an eye on it while it’s mixing to see when the texture seems exactly right. I usually stop adding flour just as soon as the dough begins to pull away from the sides of the bowl, and sometimes that might be as much as 1/4 cup short of the amount of flour I thought I would need. But sometimes you don’t realize until it’s too late and when that happens, I’ve found that a few drops of cream can really bring the texture back to where it belongs. I hope that helps! Thank for the quick reply! You ROCK! I ended up tossing that batch and making another one. I closed the windows and blinds and the second batch was a success. Looking forward to decorating them tomorrow. Ugh I guess I wasn’t quick enough! I’m so sorry for the waste. At least now you know for the future though, right? Thanks Kim and have fun decorating! I wanted to pop in and say thank you for the tips – this recipe was a definite success! I used my own gluten free flour blend (NO xanthan gum, it does terrible things to baked goods), a dairy-free butter substitute, and my cookies turned out perfect. Delicious, wonderful mouth feel, but the best thing? You can handle them. I transferred from counter to pan to cooling racks to table and there were no tragedies. We didn’t have a half dozen headless snowmen to haunt the holidays with. The children were allowed to breathe while decorating their cookies this year. Amazing! Anyway, thank you again for sharing these tips. Seriously, the baking powder part… How could I not think of that. Genius! Hooray! I’m so glad they worked out so well for you Tara! Thank you SO MUCH for popping back over to let me know. I can’t tell you how often I get people looking for an allergen-free version and now I can refer them to your comment. Happy New Year! Mine is cocking out sandy as well. Maybe some additional butter? Jacqui are you using a stand mixer? That is what I use and for me it always starts out looking dry but after a minute or so it comes together. If you only have a hand mixer and it’s not powerful enough then I would suggest kneading it together by hand. I just edited the recipe with a little more specific instructions. I hope that helps! I was lucky enough to find this recipe last August – it is absolutely the best cut out sugar cookie ever! It’s got to be the cornstarch (i use cornstarch in my shortbread) and the fact that there is no baking powder in the recipe. I no longer look at any other cut out recipes – this one is perfect! I also only mix the wet ingredients with my KitchenAid mixer. When it’s time to add the dry ingredients I use a wooden spoon, not the mixer. I get so many compliments on these cookies – I use one TBS of vanilla and 1/2TBS of almond. I use the corn syrup glaze for the icing and also use a 2:1 ratio of vanilla to almond in the icing recipe. They not only look great because they don’t spread all over the place but they’re delicious also! Thanks so much! I am SO happy you like them as much as I do, Carol! This past Christmas I made them again, this time with a little almond just like you mentioned. I loved them even more with the almond! It’s such a lovely flavor. Thank you so much for reading my blog and for the awesome feedback! Thanks for the recipe and tips. Can you share the PB and strawberry recipe you referenced for your daughters Halloween. Hey Valerie! I believe the recipe I followed can be found here, subbing peanut butter for Biscoff spread, and adding freeze-dried strawberries. Thanks so much for reading! Hi Allie! Just tried this recipe and its amazing! Thank you so much for sharing it! My only question is, do you freeze them? If you do, do you do it before baking or after? Thank you!! I had a hard time getting the dough to form at first, but your suggestion to add bits of heavy cream until it forms helped with that. I am so excited to find a dough recipe that actually holds its shape!! Thank you!! These worked perfectly! They did not spread out at all and look beautiful! I wish they tasted a little better. I should have read the comments first because I could have cut back a bit on the flour and amped up the flavors. They are like a dry shortbread and not very sweet. I’m planning to add icing so hopefully that helps, and if not, they may be good with tea or something. They do look great though! I’m so glad they worked out for you Rachel! Thanks so much for sharing your experience. I think you’ll find that the icing really balances out the flavors. Hope you enjoy! I came across your website yesterday and decided to try your recipe for cutout cookies with neat edges. I am amazed. My cookies did not spread, even when I re-rolled the dough several times. I have just started a part time decorated cookie business working from home. I sell about 5 – 6 dozen per week. I was having trouble with my old recipe not holding shape and appearing flaky and bumpy on the top. Your recipe fixed that and it is much easier to make. I am looking forward to trying some of your other recipes in the future. I’m so thrilled they’re working out so well for you! Thank you so much for the awesome feedback, and best of luck with your cookie business! Some of the commenters said their dough was dry and crumbly. I find that if I “overwork” the dough it will do this. When you roll out the dough, gather the scraps, re-roll it, etc. your dough toughens and dries out – especially if you’re using flour to dust the surfaces. I’m going to try your parchment paper method – love that idea!! Thank you Allie for this recipe. I’m making cookies for a baby shower and want them to look professional. I’m a pretty good baker but I’ve always been disappointed with my sugar cookies looking like a blob after they were baked. I cut them from my cookie rotation because of it. Now I can add them back in. Thank you so much for this Terrie! Excellent tips, and I would add, that if you accidentally overdo it with the flour and the dough becomes crumbly, you can moisten it back up with a few drops of cream. I’m so happy you are going to give this recipe a try! I hope it meets your expectations. Good luck with the baby shower cookies! Hi Allie. I just wanted to pop back by & let you know that the Penguin cookies I made were a HUGE success thanks to your recipe. The cookies were delicious and looked great too. I covered them with a thin layer of marshmallow fondant (when they were fresh from the oven) and it was heavenly. I was making my Christmas cookie list and stopped back by to get the recipe so thought I’d let you know. Thanks again for sharing this. Hi, I love your cookie recipe! I want to make faux dogie biscuit cookies with this recipe for my daughter’s birthday party at her preschool (she’s going through a puppy phase). While my daughter loves these cookies, I’m worried they won’t be sweet enough for the other kids. Is this recipe good for little kids in your experience? Can I up the sweetness slightly? I used strawberry buttercream for the icing and I don’t want to go too sweet. I saw the PBJ recipe you used for your child, which looked great, but my daughters school does not allow nut products. I’m sort of at a lose for how to proceed. If you could give me some direction, I’d be so grateful. This is my first class party as a mother and only my second batch of homemade sugar cookies ever. Thank you so much! Hey Crystal! I’m so glad you like this recipe and it sounds like a really fun idea you have in mind. My kids have always loved these cookies but I do think they taste best when decorated with some kind of icing or glaze. I’m partial to royal icing (you can grab the recipe here: https://bakingamoment.com/iced-chocolate-peppermint-cookies/). Your strawberry buttercream sounds like another great option. If you’d like to try a nut-free version of the PB&J cookies, you can replace the peanut butter with sunflower seed butter. The taste is almost identical and you won’t have to worry about tree nut allergies. Dough was too wet even at 1 3/4 cups of flour. Was it because of my peppermint that I added? Since I was going to chill the dough I did not add any more flour for fear that it would be crumbly but it remains a soggy mess even after chilling…. Help!!!! Addie just go ahead and add additional flour- sometimes the dough needs more and sometimes less. Just add flour until it pulls away cleanly from the sides of the bowl. Hope that helps; good luck! I have a quick question. To make the recipe above into the chocolate one do I just add cocoa powder? If so how much? Any other adaptions to the dry ingredients if i do this? That’s a great question Andria but no I’m afraid it’s not quite so simple. Cocoa is dry and actually a little fatty so just adding it to a vanilla cupcake recipe can really throw off the chemistry. You’ll want to check out my chocolate cupcake recipe, which can be found here: https://bakingamoment.com/simply-perfect-chocolate-cupcakes/. Good luck and I hope you enjoy! That is such a great tip Esther, thank you for sharing! I use a stand mixer and it’s pretty powerful, but I can imagine if one only has a hand mixer the dough might be a little too stiff for it. Kneading it together with your hands is definitely the answer. I’m so glad it worked out so well for you – thank you so much for sharing your experience here! Hi, Allie! I have been on the hunt for the perfect cutout cookie for my daughter’s birthday, and I have a feeling this may be the one! I was planning to use some almond extract instead of the vanilla bean paste. Would you recommend an even exchange of a teaspoon of almond extract for the teaspoon of vanilla bean paste? Will it being more liquidy affect the texture too much? Thank you in advance for your help! Hey Bre! I think almond would make an excellent substitution! Definitely give it a try. I don’t think it would be too liquidy at all, but in my experience almond extract does have kind of a stronger flavor, so you may want to decrease the amount just because of that. It’s really up to you though! A little more or less won’t disrupt the chemistry of the recipe. You can use your judgement, and “season” it to taste 🙂 Good luck and I hope you enjoy! A lot of good ideas, tips and tricks that I will be using for sure! I will be baking those beauties in a few days, but I was thinking if I can use fondant instead of icing for decoration? Allie, just made those cookies today and they turned out great! Thanks again :))?? Oh I’m so glad! Thanks so much for the feedback Esurbeva! Aw, thank you so much! You are the sweetest, Kayle! I’m currently attempting to make these and I’ve hit a snag. The dough is sticking to everything. What have I done wrong and what can I do differently. It’s even sticking to the parchment paper that I’m using to roll out. You need more flour! Not sure what went wrong there, sounds like perhaps something was measured incorrectly. But if you add more flour you might be able to salvage it. Good luck! Hi! I just want to make sure that the recipe is correct when it says 4 cups of flour. I’ve made it twice and have found it very hard to get the dough to stay together with that much flour (I add 1 cup at a time), so just thought I’d reach out to see! It looks like a few others have said the same, so was wondering if it maybe should only be 3 cups? Thanks for your help! Hey Emily! Thanks so much for reaching out and for the great question. I think it’s a good idea to add one cup at a time. You may be able to get away with less but this is what always works for me. That said, I do use an electric stand mixer, and it’s pretty powerful. It usually starts out looking very “sandy,” but after a few minutes it does come together and form a ball. If I do less flour, the dough tends to be quite sticky and hard to work with. For me, it’s worth taking the extra time to work in all 4 cups of flour. If you’re using a hand mixer and it’s not allowing the dough to come together, I know other readers have had success with just kneading it all together by hand. I hope this is helpful! Thanks so much for the quick reply! I’ll try kneading by hand! Thanks again!! You bet! Good luck and I hope it all comes together for you. “Odds are, you are either shipping your cookies or delivering them by car…” I’m going to be eating them!!! Hi Rosa! You can definitely do that. Just swap out some of the cornstarch & sub with flour. Good luck and enjoy! This was an absolute disaster! I ended up with sand!! I followed everything to a T, but I kept thinking that the dry ingredient mix was a LOT, but kept adding it anyway. By the time I got it all in, I have nothing but a sandy mixture that is unusable. I am crushed. I live in Europe where the shops are closed today, and I am supposed to deliver American style Xmas cookies to my son’s daycare tomorrow morning. Any idea what went wrong?? Update: I added milk to get the dough to a usable consistency. The flavor is more like a flour biscuit rather than a cookie. We don’t eat super-sweet things where I live, but the sugar was almost undetectable. I added about another 1/3 cup of sugar and baked. The baked appearance is not nice, and the final result is a very unpleasant taste–no hint of sweetness. Overall I just crushed at how this turned out after the time and ingredients I put in to it, and will have to throw it all away. The ingredients in the country that I live in are not significantly different from what you get in the US, but perhaps this recipe just doesn’t work with non-American ingredients. I’m sorry for your trouble. I really think it was a mistake to add milk though. The better option is to continue working the dough until all the dry ingredients are incorporated. I know it does start out very dry, but if you put some muscle behind it, it will come together and it becomes quite workable. As for the taste, the reason it is less sweet is because these cookies are meant to be iced with a very sweet royal icing. I think you’d find that that balances the flavor in a very nice way. Again, I’m sorry for the difficulty you had. If you decide to take another crack at it, perhaps watching the video tutorial would be helpful. I’ve tried the recipe again in the same afternoon and doubled the sugar and vanilla for flavour and texture. Too wet… same old fussy sugar recipe…. Thanks for the update! Good to know that the ingredient amounts listed are spot on. Have a great day! Thanks Sam! I think you hit the nail on the head as far as texture. Definitely meant to be soft and semi-crunchy. That’s great that you were able to get so many cookies out of a batch! How thick were they rolled? Rolled to 1.5mm and still look much thicker than your pictured cookies. Hi Allie — I’ve never commented on an online recipe ever, but I had to thank you, thank you, thank you! I had gone through 3 batches of 3 different recipes before trying yours (nearly losing all hope), and they turned out perfectly. So clean, crisp and *zero* spreading. I had run out of cornstarch by the time I got to your method, so I turned to potato starch (!) to make up and the difference, and it seemed to work fine. The cookie has just the right amount of sweetness, given they are to be decorated with even more sugar. I am so, so pleased to have come across your website – you are a genius! Happy holidays, to you! Stef! I am so thrilled that this worked out so well for you! Thank you for commenting with your positive feedback. And I’m so glad to hear that the sweetness was just right for you. There are some readers/commenters who have complained that they’re not sweet enough, but I agree- when they’re coated with royal icing and sugar sprinkles, it all works out. Great to know about the potato starch too! Thanks so much for taking the time to come back and leave a positive review! Happy holidays! I’ve been looking for a recipe for cutout cookies that would keep their shape for years. Found this recipe, watched the video, gave it a try….and I have found THE recipe that works!!!! My cookies came out PERFECT!!! Thank you!!! Where oh where has this recipe been all my life? I just made a test batch of this dough and I’ve never been able to successfully make dough or cut out cookies for some reason even though I can actually cook & bake very well haha. This dough is amazing, easy to roll out and I have my second batch of cut out cookies in the oven now. These absolutely do NOT spread. They stay right in the 4″ heart shape I made them in. They are very tasty almost like those danish butter cookies which are my favorite. I didnt have a stand mixer only a hand mixer so do yourself a favor if you can and buy one which is what I am doing today. The hand mixer worked just as well though tiring and you’ll have to pull your dough together just like she said and roll them out. These are awesome! Thanks!! I’m so glad you’re happy with this recipe Tanya! Thanks so much for the great feedback, and the tip about using a hand mixer. Enjoy! Awesome! Thanks so much Nicole I hope you enjoy! Hi, I have been looking for a cutout cookie recipe where the cookies don’t spread and came across this one. So, I’m going to give it a try for my stepsister’s 30th birthday party this weekend. I do plan on decorating them with royal icing as well. I have been having a very difficult time finding a recipe where the cookies don’t puff up or spread. I don’t have time to make a test batch, so I’m a little nervous. I don’t have vanilla bean paste. Will that effect the flavor at all? Can I add extra vanilla extract? Hey Lisa! You can leave the vanilla bean paste out or sub with extract. Good luck! They came out great!!! I’m so excited, they actually look like shoes and crowns! Thank you!! That’s great news! So glad you are happy with the recipe. Thanks for the great feedback Lisa! Great post. I’ve been always looking for this kind of recipe, with all the tricks. you’re amazing Allie. I appreciate you for these all . I’ve tried this recipe and the cookies came out as they were, with no spreading out. the taste was great either. My pleasure Rose! I’m so glad you were happy with the result. Thanks for the awesome feedback! HI. I have been making cut off butter cookies for years. I was searching for one and came across to yours. When read it and based on experience I said YES. This is perfect. But….I tried it following everything and didn’t work. It was very crumbly and dried. Couldn’t pull it together. I ended adding more butter and flour and mixing. Basically trial/ error. I took a little, baked a cookie, tried and adjusted until I ended with a good one. I am not sure why it didn’t work for me since honestly I agree your proportions should work. Any thoughts? Hey Carina! Thanks so much for reading and trying one of my recipes! I’m sorry you didn’t quite get the results you were after. Question: are you using a stand mixer or a hand mixer? I use a stand mixer and it’s quite powerful. I think if you are using a hand mixer it might not be strong enough to combine the ingredients of this very stiff dough. I have two suggestions: 1) Add the flour just a little at a time, instead of all at once, and 2) if your mixer can’t handle it, try kneading it in by hand. Hopefully that is helpful! Hi! I was wondering if I could add matcha powder into this recipe. If so, how much do I add? Hey Magg! I think that would be just lovely. Personally, I think matcha can be somewhat overwhelming in large doses, so I would start with about a teaspoon and see if you like the taste. You can always add a little more if you feel like it needs it. Good luck and enjoy! Hey Jane! I’m so sorry you had trouble with the dough! There are a few other comments similar to yours on this post. I really think that if you aren’t using a stand mixer, it’s harder to get the ingredients incorporated into this very stiff dough. I’ve advised other readers to try kneading it by hand a bit, if their mixers just aren’t quite powerful enough. Also, be aware that as the dough sits, it becomes drier, so if you don’t plan on rolling it out right away, it’s best to add a bit less flour. If life gets in the way, and you aren’t able to do it all at once, you can bring back a too-dry dough with a few drops of heavy cream. Hopefully that helps and you’ll have better luck next time! Hey Clarissa! I’m so happy you like the recipe! I’m sure you probably could, the only thing I would caution you about is the dough maybe getting a little dry. I’ve noticed that when I don’t roll/cut/bake right away, it can get a little crumbly. Maybe you could compensate for that by adding a little less flour. I hope that’s helpful! Good luck! Hi there! Thanks for sharing all your tips…trouble shooting question. I use Sweet Sugarbelle’s cookie recipe and have never really had an issue until lately. Some of the batch ends up with a cracked and crumbly top to it? As I said, it’s never really happened before, I haven’t changed anything in the recipe…I wonder what I’m doing and don’t even know it! THanks for the suggestions! Hey Pam thanks so much for reading! I wish I could help you out but I really don’t know much about Sweet Sugarbelle’s recipe. This is the recipe that I’ve been making for the last 5+ years so if I can ever help you with this one, don’t hesitate! You can, just omit the kosher salt from the recipe then. Good luck! Hi Allie! Are you using a convection oven to bake these cookies or conventional? I’d like to give your recipe a try. Thanks so much! Hi Allie, just WOW! Your cookies came out really great! The sweetness level is just perfect, and the crisp corners and tender crumb were exactly what I wanted! No spreading whatsoever with this recipe and very sturdy! I cannot wait to give your chocolate other a try! Thank you so much for such a fantastic cookie!!! My pleasure Fabian! I’m so happy you were pleased with it! These turned out great! Don’t know why I didn’t think of using cold butter…this saves a lot of time and effort!! Will this recipe work using Lemon flavor instead of vanilla? I am looking for a cookie recipe for Lemon Cutout cookies I need to make about 100 heart shaped cookies. Yes, I’m sure it will Terri! You can either use lemon extract in place of the vanilla, or just add lemon zest and a few teaspoons of fresh lemon juice. Good luck and enjoy! I was wondering if I can omit the eggs. My child is allergic to it. The poor kid can never buy cute cut out cookies at the store n the inadequate mom could never make these pretty cut out cookies because the dough ALWAYS spread as far as the green pasture in Ireland. Any suggestion ? Hey Ming! I don’t know if it would work as well, but have you ever tried using a flax egg? Basically you just soak some ground flax seed in water until it jells. This can be used as an egg substitute. Allie, My family has gone ga-ga for these cookies. Today I added dried cranberries to the mix and they have turned out fantastic. I haven’t decided if I will ice them or not. This has been a god send since my family loves cookies so much I make a batch every week. That’s awesome Kellie! I’m so happy you and your family are enjoying! Thank You Allie for your response!!! I have absolutely fell in love with this recipe! I stuck to the 4 cups up flour and the cookies taste Awesome! Everyone loves them! I’m so glad to hear it Stacy! Thanks so much for the great feedback! Hi! I’m trying to make cut out cookies for my nieces birthday party. I tried your soft and chewy sugar cookie recipe and did the cut outs with that it worked fine but some cookies lost their shape. I like sugar cookies that are soft and chewy rather then the harder sugar cookies. Does this recipe make the cookies chewy as well? Hey Reyna! I’m so glad to hear that you were happy with the soft & chewy recipe! This recipe here yields more of a tender, shortbread-like texture. It can be crispy if you bake them a little longer, or more tender/soft in the middle if you underbake them slightly. The good news is, they absolutely, positively do not lose their shape at all! Another quick question. I want to make a test batch. Can I cut all the I gradients in half for this and still have the same effect? Yes you can! I’ve done it many times & it works well. Good luck Reyna! I’m so excited to try a recipe that doesn’t spread–finally! However, I just moved to Colorado and am not experienced baking at altitude–any recommendations on altitude adjustments? Thank you! 1) The cookies may have a drier texture at high altitudes, so you may want to add 1 to 2 tablespoons of heavy cream to the dough. 2) If the cookies spread too much, decrease the amount of sugar slightly. 3) Bake times may need to be adjusted. Keep an eye on the cookies as they bake, and pull them from the oven when they’re set around the edges. There’s more info here, if you’d like to read up on it. Good luck and I hope that’s helpful! Thank you so much for this recipe! I’ve made at least a dozen different sugar cookie recipes in the past couple weeks trying to find one to make cookies for my son’s day care class. I needed a cookie recipe that would let me use a large cutter (4″) with a design that would stand up to icing and 2 year olds. The others all puff up too much, spread too much, and fell apart too easy. This one was a dream to work with, it came together so easy, and it’s a simple recipe. I don’t think I’ve ever been able to make cookies so fast! I haven’t iced it tasted one yet (doing that part tomorrow) but honestly, they could taste like dirt and I’d still be happy after being so disappointed with so many other recipes. And I know it won’t taste like dirt haha! Thanks again! Haha! I’m so glad you are happy with it so far Angela! Thank you so much for the awesome feedback and hopefully they don’t taste like dirt lol. I did taste one last night without icing and it was good! I always weigh my ingredients and it came together great. Rerolled the scraps and they worked just as well as the original dough and didn’t once have to flour/cornstarch my counter! Seriously, I can’t say enough good things about this recipe! It’s a lifesaver! did you make a mistake and put 4 cups all purpose flour? because i followed the recipe EXACTLY it says 4 cups and the dough is sandy. it does not hold at all. I’m sure I didn’t make a mistake because I’ve followed this exact recipe several times a year for about 6 years now. If it’s sandy you just need to mix it some more. It will come together! Hi Steph! Large eggs are pretty much the standard for baking, and that’s what I used here and for all the recipes on this site. Have fun and enjoy! This is now the only cutout recipe I use, period! I love decorating cookies for the holidays or birthdays and my guests rave about these. The shortbread like taste and texture balances nicely with the sweet royal icing. Its just perfect! We live in a very dry area, and if the dough is super crumbly I add a tiny bit (maybe a TBSP) of oil at the end. It helps it come together without making the cookies spread. That is such a great tip Samantha! Thank you so much for sharing. And I’m so glad you and your family have been happy with the recipe! It’s definitely a favorite around here too. Hey there! I was just wondering if your no spread sugar cookie recipie can be made and refrigerated to use at a later date. If so, what would be the recommended way to store them and how long can they be stored for? Hi Elizabeth! Yes, you can make this dough ahead. Just be aware that as it sits, it tends to dry out. So, you might want to add a little less flour to the dough. It can be refrigerated for a few days, or frozen for a couple of weeks. Just wrap it tightly in plastic wrap and place it in a zip-top bag. If you find it’s become too dry, you can moisten it back up with a few drops of heavy cream. It should hold together well, but not feel too sticky. Hope that’s helpful! Good luck and enjoy! Hi, Allie: I made this recipe a few times and made only minor changes (I used 1 tablespoon of vanilla extract, and 1 1/4 cups sugar; these changes may eliminate the floury taste another reviewer mentioned, but I have made it as written and thought it was fine, but I like my changes also). I made the dough today, and divided it into 3 pieces (I weighed the pieces) and rolled each piece to 1/4-inch thickness between 2 sheets of wax paper. I stacked the slabs of dough onto a jelly roll pan, and covered with foil, and put into the refrigerator until tomorrow. I did this last Christmas and it works fine. Tomorrow’s cookies will be with Halloween themed cutters. Instead of icing, I prefer to brush the cutouts with beaten egg white and sprinkle with colored sanding sugars. Anyway I want to thank you so much for this wonderful recipe which does not spread. It’s amazing that cookbook authors are still including leaving in sugar cookie cutout recipes. Thanks again, and happy baking!! That’s terrific David! I love your changes and the tip about rolling and stacking is brilliant. What a time saver! I was wanting to make a “healthy”, Paleo-ISH stained glass cookie. I just made these using spelt flour instead of regular and arrow root instead of cornstarch. It worked great! Thanks for the recipe. My pleasure Rose! I’m so glad it worked out well for you. Thanks for the good feedback! My dough was crumbly and all of my cookies were cracked. I dont know what I did wrong. Hey Leslie! Sorry to hear you had trouble. I think you had one of two issues: either you didn’t mix the dough long enough or you added too much flour. If that ever happens again, just moisten up the dough with a few drops of heavy cream. It works like a charm! Thank you Thank you Thank you for sharing this recipe! These were wonderful and the ONLY recipe I have ever tried that actually kept the shape of the cutout! Delicious! Aw that’s wonderful Holly! I’m so glad they worked out well for you. Thank you so much for the great feedback! I’m trying to make cutout letters, preferably chocolate chip.. Do you think this recipe would still work if I added mini chocolate chips to it? Or a recommendation to how to make them snickerdoodle? Hey Kristen! Sometimes I add stuff in to this dough but one thing I find is that it can sometimes make it a little harder to cut the shapes. If the edge of your cookie cutter lands on a chocolate chip, it might goof things up a bit. To avoid that problem, I’d suggest using finely chopped chocolate instead, a la this recipe: https://bakingamoment.com/coconut-straciatella-shortbread-cookies/. If you’re looking for a snickerdoodle inspired variation, try adding cinnamon to taste. Good luck and enjoy! Hi Allie, Thanks for your recipe, tips and video! I can’t wait to try your recipe! I have a question about the parchment paper you use. I clicked the link to where you purchase yours, but could not find a product/brand that sounded like it would hold up. I use rolled parchment paper now and it’s a pain to cut it to the right size to fit the pan. However, once I get it to the right size, I can us it to roll the dough or bake the cookies and reuse it multiple times without having it tear. Would you mind please sharing which parchment paper product you use? Thank you! Hi there! I’m afraid I don’t have a gluten free flour mix. But there are several brands on the market that can be substituted cup-for-cup with regular flour. I’ve heard good things about King Arthur Flour and Bob’s Red Mill. Good luck! Any thoughts on adding fresh cranberries to these cookies? I read in comments ( read all of them, like to get everyone’s feedback 😜) someone added dried cranberries but don’t like the taste/texture vs fresh. Came upon your blog because I started a search “can you make any cookie recipe into cutout shapes” and the recipe I was wanting to do it to was a cranberry orange shortbread cookie recipe and you said these cookies a mixture between sugar cookie and shortbread…perfect!😍 Thanks for any suggestions. Hi G! I’m not sure about fresh cranberries, they might give off a little too much juice, but I recently made them with dried and they were delicious! You can check out the result here: https://bakingamoment.com/cranberry-orange-shortbread-cookies/. Hope it’s helpful! I have tried cut out cookies years ago with no luck. My snowman cutout looked like he melted. This year I decided I wanted to try cutouts again and found your recipe. What an amazing recipe. I threw cold butter in the mixer and within minutes I had a cookie dough that was easy to roll, held it’s shape when transferring to my baking sheet and baked up looking just like the heart cutter I used. They are cooling now and later I’m going to try my hand at royal icing. Thank you for sharing your recipe. I’m sure it will get lots of use in my house for sure. Thanx again from a new fan! Hooray! So happy you were pleased Kathy! Welcome, and I hope you find lots more recipes here you love! hi i would like to ask is it soft? or crunchy ? Hey Nada! I would not call them soft, they are more of a tender-crisp texture, similar to shortbread. Not exactly crunchy but not soft either. 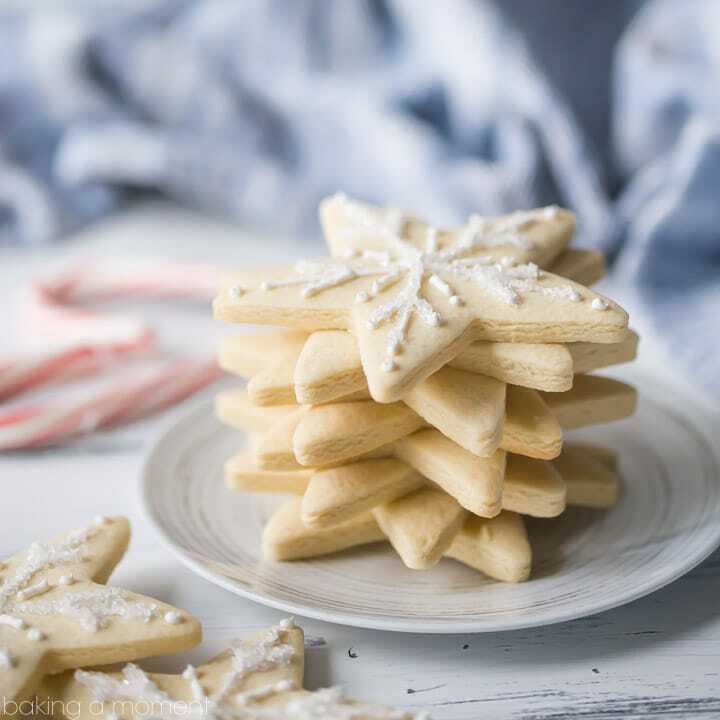 These are really sturdy and good for decorating, but if you’re looking for a soft sugar cookie, give this recipe a try: https://bakingamoment.com/soft-and-chewy-sugar-cookies/. Thank you so much for sharing your recipe for cut out cookies. I am over the moon with it. Worked perfectly for making bauble decorations to top my cupcakes. I’m so glad you’re happy with it Sarah! Thanks so much for the good feedback. Your cupcake toppers sound adorable! Hi there! Thank you so much for this! Just tried a batch of these tonight and was pleasantly surprised! I do think I might have to cut back on my flour, though. I think I tend to pack my measuring cup a little heavily with flour even when I try not to! Because of this, my consistency was a bit dry, even with my kitchen aid paddle mixing for a few minutes. I also had some cookies (not all) rise up and crack just a tad. Any other suggestions? Hi Miranda! If you’re packing the flour into the measuring cup then I’m sure that’s probably the cause of the problems you’re describing. I usually “fluff” my flour with a spoon to aerate it, then lightly spoon it into the measuring cup until it’s overflowing, then I scrape the edge of a knife over the top to level it. Hope that’s helpful! The recipe worked perfectly the first time! Consistent results, even with the usual oven temp fluctuations. I have been trying to find a recipe for cookies that hold their shape for so long, but never found one with the results I wanted. These cookies stayed stock still the whole bake. They have a buttery shortbread taste that you would find from any decorated cookie service or store. I am so happy this worked! Thank you! My pleasure Megan! I’m so glad you were pleased. Thanks so much for the positive feedback! Hi i am going to try this lovely recipe this weekend, can i check if i cannot find cornstarch.. can i replace it with cornflour? I’m not really sure to be honest Charmaine- I think cornstarch is called different things in different countries. I’m in the US and here, cornstarch is a very fine white powder. Corn flour is also called corn meal here, and it’s darker in color and a lot more granular. You want the white powder! Hope that is helpful! Cornflour and cornstarch are the same item in Australia. I am going to try these soon for Valentine’s cookies. I don’t think I’ve come across a cookie recipe using cornstarch. How thick should they be rolled out? It’s actually in the directions section of the recipe card. You can roll them out to 1/4-inch thick. Good luck! Made these today for my spouse to take to work. I usually resist rolled cookies b/c I have no patience for the decorating. These cookies, without icing, are perfect for my taste. Enjoyable with a cup of tea, coffee or hot cocoa. My tweaks: used room temp butter b/c that is what I had on hand. The dough is sooo easy to work with. Formed a nice ball, away from the KitchenAid mixer bowl perfectly. Separated the dough and coloured with Wilton’s gel icing to mimic the boxes of candy hearts I had as a child.I don’t know what it is about this dough but I did not have to clean the bowl between colours. Bonus! First batch at 375 were not bad, not burnt at all but I lowered the oven to 350 and they baked perfectly in 8 minutes. My oven is fairly new and fairly accurate (and hot). And my butter wasn’t ice cold so that could be why that worked for me. And lastly, I added the zest of a small lemon and about 2 tsp fresh lemon juice to the batch I tinted yellow. Roughly 1/3 of the dough. So amazing. I highly recommend it. I evened used a scalloped heart cookie cutter and got precise, perfectly baked cookies. By this time the dough had been out at room temp for at least 35 minutes. No trouble with rolling, even after the addition of the lemon juice. I did a few puzzle cookies. Heart from one colour dough and the arrow through it in another. Baked perfectly. Clean up was a snap! Definitely pinning the recipe for later. Might even try it with cold butter 🙂 And chocolate too, of course. I’m so happy you liked them Dawne! Thank you so much for sharing your experience; I think it will be really helpful to other readers. Have a great day! I have been making this recipe and your chocolate Rollout cookies with great success. No others I’ve tried compare to the ease of rolling and taste. I love both recipes. I have tried a couple others that I have found on the internet but my husband always says these are good but I like the other ones you make. Great compliment! I would like to know if you have ever given a peanut butter roll out a try. Do you think I could just sub some of the butter with peanut butter and still be successful? I might have to try it out but wanted to get your thoughts on the substitution. Thank you again for sharing your recipe. Thank you so much for the great feedback on both the chocolate and vanilla versions! And thanks too for the great question. I actually have made a peanut butter version- I should really put up a recipe for that! Until then, I would refer you to this post: https://bakingamoment.com/decorated-biscoff-cut-out-cookies-for-st-patricks-day/, which is for a cookie butter version. You can just substitute peanut butter for cookie butter (aka: Biscoff Spread or Speculoos) and it works beautifully. I think you and your husband will really enjoy them Kathy! I’ve been looking for this kind of sugar cookie recipe for ages. Hapy found this one. Thank you. So glad you’re pleased with the recipe Cheryl! Made this recipe several times with a great turn out! Love it! However, last night I have 3 dozen graduation cookies to make and I was frustrated that I couldn’t get the dough to “come together”. I thought maybe I did something wrong, mismeasured so I bagged up first batch hoping to salvage it somehow and started again on new batch… again failure… and yet again failure. Comes out very crumbly everytime … never has this problem before what am I doing wrong??? please help I can’t roll it out nice or even pick up the cookies without them falling apart. I didn’t throw out the other batches I put them in a big zip lock and put in the fridge in case I could salvage somehow. Hey Michelle! So sorry you’re having trouble this time around! I can’t imagine why, if this recipe has worked for you in the past. Maybe it’s just a very dry day for you. The good news is, there is an easy fix! Just pop your dough back in the mixer and beat in a little heavy cream. It could take just a few drops or it could take several tablespoons, it all depends. Use your judgement and when the dough is a nice texture (not too sticky), you should be good to go. Also, you might want to check out my newest sugar cookie recipe: https://bakingamoment.com/soft-cut-out-sugar-cookies/. These are so incredibly soft, I just love them! Thank you for your recipe. Before I try it I’d like to clarify the weight of the flour as the cup measurement is so subjective. I’m based in Australia and 1 cup US doesn’t equal 1 cup Australian so using the weight is the most accurate. So please advise what is the weight of 4 cups flour in your neck of the woods. Many thanks. Hi Vita! 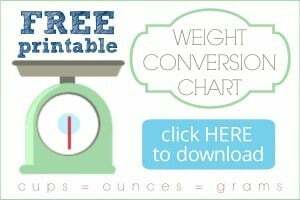 I have heard that cups are different in AU, and I know that many other countries prefer measurements by weight- so that is why I created the free printable weight conversion chart download. You can find it in the right hand sidebar! You might want to also check out this post: How to Measure Ingredients for Baking. Hope that is helpful! I made these and pretty edges for sure but the dough was hard to roll out! It kept breaking as I rolled. Hey Joanna! It sounds like maybe the dough wasn’t mixed quite long enough. Either that, or it sat for too long before being rolled. If you don’t plan on rolling/cutting right away, you should add a little less flour. The dough will dry out as it sits. Hope that’s helpful! I tried the recipe for the cookies last night and the dough never came together. It was so hard to even roll out. I did my best and the cookies baked and came out with cracks all over. I ended up adding a little bit of water to the dough and was able to bring it together but it still had cracks. I am hoping they taste ok because today I’m going to frost them. I live in Nevada where there is little humidity. Is that why this happened? Could be Nancy! Low humidity could definitely cause your dough to be overly dry. I’m not sure if you were using a stand mixer or not, but they tend to be more powerful and if you let it run a little longer it will really help the dough to come together. It’s also helpful to add the flour a little at a time, rather than all at once. If you’ve tried all that and it still seems too dry, you can always moisten it back up with a few drops of heavy cream. Sorry you had trouble this time around! Hopefully next time you’ll have better luck. I used s stand mixer and I mixed for a bit longer to see if it would come together. I took the dough out and added some water to bring it together. I never gave up because of all the comments that everyone made that the cookies were delicious. The next day I frosted them and they were amazingly delicious. I will definitely try this recipe again and add the heavy cream. I’m so happy you liked the taste! Maybe next time just save yourself some trouble and use a bit less flour, since you live in such a dry environment. Thanks so much for following up! Hi Allie! I tried your recipe tonight and sadly the dough came out awful to me. I use a hand mixer and live out here in Texas, the dough never came together unless I pressed it together myself. They tasted really just like flour and when I tried kneading confectioner’s sugar and more vanilla into them they still didn’t taste terrific and the texture was floury as well. I’m going to pick up some more butter tomorrow and try my hand again at this but using less flour. Do you have any other tips for me? I’m sure this recipe is great, its just an error on my part. Hey Addy! So sorry you had trouble. If your environment is very dry, and you’re just using a hand mixer, it can be difficult to incorporate all the flour into the dough. There are other readers who have also had the same difficulty, and if you give a quick skim over the comments you’ll see lots of tips there for those who don’t have a powerful enough mixer or who added too much flour at once. I think you’ll find it really helpful! PS- they are going to taste very flour-y when they’re raw, that’s kinda just their nature but they bake up quite tasty, especially when topped with a sweet icing! Hi Allie! 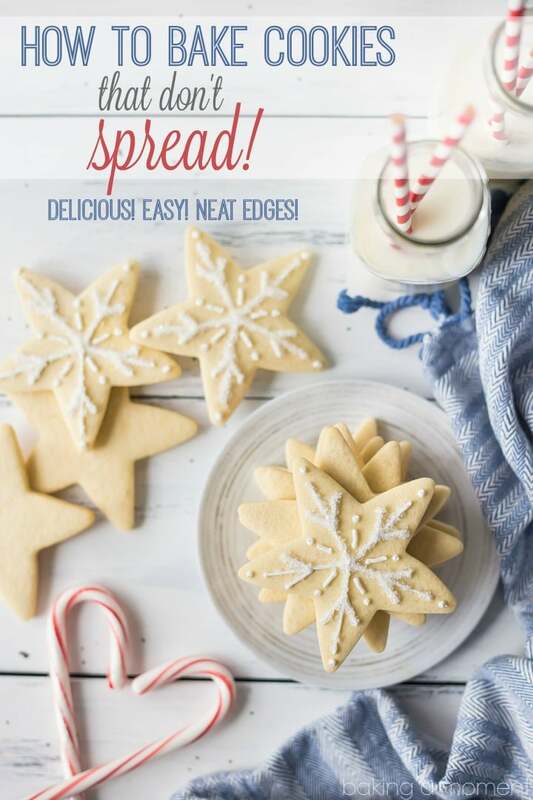 I just tried your No Spread Sugar Cookie recipe yesterday and WOW, I absolutely love it! They held their shape beautifully!!! I have used Sweetopia’s recipe for years. Everyone loves the taste of them (including me) but they spread which drives me crazy. Your recipe is both delicious and hold their shape! I’m in cookie heaven! My question is that after I bake them, I let them sit overnight on a paper towel in a baking pan covered in foil until I’m ready to decorate. Once decorated, I let them dry the same way overnight. Will they get hard sitting that way? I haven’t had any issues in the past but since this is a new recipe, I was a bit worried. Thank you for your generosity in sharing your recipes & techniques! Hey Marcie! I’m so glad to hear that you’re happy with the recipe! I think they should be just fine for at least a couple of nights if you leave them sit the way you have described. And hey, if you need a royal icing recipe to decorate them with, you might like this one: Royal Icing/. Have fun! I have to say these by far were one of the most successful cookie recipes I’ve made yet. I’m always apprehensive making cookies (especially sugar cookies) since they don’t turn out the way i like more so they don’t keep their shape. But this worked out perfectly. I like the reasoning behind your recipe and enjoyed reading your blog and followed to the t. Thank you so much! It helped moreso because I made these cookies for baby shower and they had to keep their onsie shape which worked out great! Thank you so very much for sharing your knowledge! My pleasure Ankita! I’m so happy the recipe worked well for you. Thank you so much for the positive feedback! Lovely recipe which I’ve made several times. I tend to reduce the sugar and they come out great. This recipe was great and exactly what I was looking for! I need to make a large batch for wedding favours, can I double the recipe successfully by just double the quantities of each ingredient? Yes you can, as long as your mixer is big enough to handle it, that should work just fine! Great recipe BUT mine puffed up and my shapes were not sharp and i did cut down on the flour to 2 3/4 cups and 1/4 cup corn starch.I think on the next run i’ll only add one egg to see if this will help. Over all I’m loving the softness to the cookie. They look beautiful! Just wondering how long these cookies should last for? Am hoping to bake in advance, store in an air tight tupperware and ice them later in the week for a party on the weekend. Hi there! They should last about a week at room temperature, 2 weeks in the fridge, or 2 months in the freezer. Have fun! So I tried this recipe, mixed it forever… and it just turned to sand, never pulled away. I realized later that I never added eggs… and when I went back and looked at your recipe, I realized… you never say in the instructions when to add the eggs, lol. Hey Kelly! I’m sorry to hear you had trouble. It says it in step 3 of the recipe instructions: “Mix in the eggs until incorporated.” Hopefully you’ll have better luck next time! Hey Joanna! They are pretty much the same as any other cookie. Probably a couple of weeks refrigerated, and a few months in the freezer. Good luck! Can this dough and the baked cookies be frozen and still be as good as if you just made it/them? Hey Pam! You can do that, but I would recommend adding a bit less flour. As the dough sits it tends to become drier and more crumbly. It might be a little difficult to work with if you make it as written, and don’t use it right away. Adding less flour at the start should remedy that, but if you notice it’s still too dry you can always moisten it back up by mixing in a few drops of cream. Hope that’s helpful! You’re very welcome! I’m so glad you and your little one enjoyed! I love hearing that! Hey, just wondering if you could use butter flavor shortening instead of butter? Hi Lisa! As long as you’re using a product that subs 1:1 for butter, it should probably work. Good luck! I cannot believe how great these turned out! I love to try to make things from scratch but unfortunately when I have tried in the past the cookies were terrible and always looked like blobs. I am so happy to have stumbled across this recipe thank you for sharing! I cannot wait to make these at Christmas with my toddler we made them tonight with our halloween cookie cutters and they are fabulous! So glad you were happy with them Melanie! Hope you and your toddler have fun this Christmas! I made these and they were very dry. I’m kinda disappointed. Maybe softening the butter instead of having it cold would make them less dry. Hi Meriel! This recipe does not make a moist, soft cookie, and if that’s what you were expecting then I’m sorry to have disappointed you. These cookies have more of a tender-crisp, shortbread-like texture. 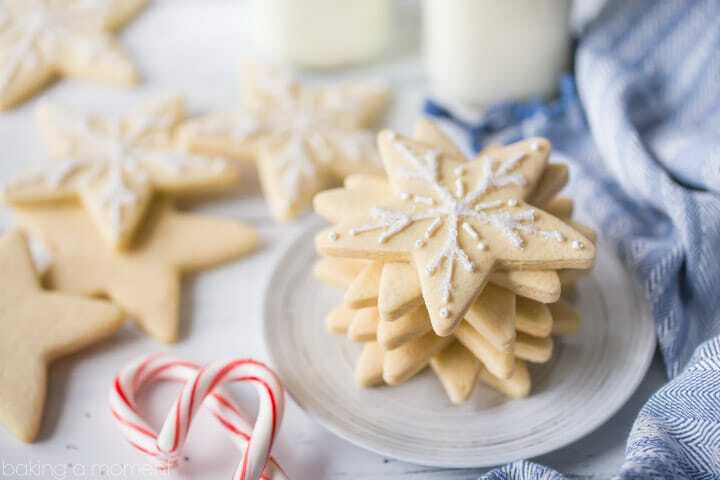 If you are looking for a soft, moist cookie, try this recipe instead: https://bakingamoment.com/soft-cut-out-sugar-cookies/. These are very soft and have an almost creamy mouthfeel. I just wanted to thank you for these tips. I’ve been baking for years and everyone loves what I make, but I have just put up with the imperfections. I appreciate you sharing your ideas for improvement. It’s my pleasure Molly! So happy you’ve found success with these ideas. Thank you so much for the positive feedback! I found your recipe last year and made the best, most delicious and prettiest Christmas cookies ever!! I forgot to pin it and I was panicking because I couldn’t find it again this year to make Halloween cookies. I did some digging though and I’m SOO happy I found you again! Thank you so much for a fantastic recipe!!! My pleasure Kathryn! I’m so happy you were able to track it down! Hey Ellen! You can but if you do the dough has a tendency to dry out. I’d recommend adding a bit less flour if you go that route. And if it still seems too dry, you can always moisten it back up with a few teaspoons of heavy cream. It should be ready to roll out once it’s come back to room temperature. Good luck and I hope you love the results! I have been searching for months for the perfect ‘sugar cookie’ recipe!! I cover my cookies with fondant, and so them not spreading, or bubbling on the top is essential to the perfect final product. These cookies/this recipe is life changing! I am SO excited and happy about the final product. So glad you are happy with them Rachael! I love hearing that! I have made these for a couple events this past week for Halloween and have had multiple requests for the recipe. I think I’ve sent out the link to this page at least 7 times this week. Thanks for a great recipe! So happy you’re liking it Chelsey! Thanks so much for sharing! Can this dough be made in a 13 cup Cuisinart blender? I’m sorry Nancy! I’m not sure. I’ve only ever done it in my stand mixer. It has a 3.5 quart bowl, if that’s helpful at all? These rolled out and cut perfectly! And they tasted amazing! Awesome! Thanks for the positive feedback! Great recipe, just in time for the holidays! Hi Sherri! If you plan on icing them, the sweetness of the icing should balance out the flavor. The cookies are intentionally a bit less sweet, to account for the topping. Have fun decorating! I just made cut out cookies tonight and they turned out PERFECT!!!! I wish I had this recipe years ago! My cookies have always blobbed out into shapes somewhat resembling the cookie cutter. Thank you so much for sharing your recipe!! It’s my pleasure Suzy! I’m so glad this worked well for you. Thanks for the great feedback! How long will the cookies last for after they ate baked,? I want to do a large batch for Christmas. Can I make them a few days ahead of Christmas ? Hey Barbara! You can absolutely do that. They’ll keep for at least a week in an airtight container. Have fun and enjoy! I absolutely love this recipe and it’s so simple to follow along to. The only problem I’ve had is there are bubbles on the surface of the cookies. What causes this and how can I resolve it? Thank you! Hi Anu! So glad you’ve been pleased with the recipe. That can sometimes happen. I’d just be careful not to get too much air into the dough when you’re making it. And if a bubble or two does happen, they’re usually pretty easy to hide with royal icing. I have been wanting to try flooded icing cookies for a whole now and last night I took the leap using your cookie recipe. I used my hand mixer to combine everything and about 1.5 cups of flour, then kneaded another 1.5 cups in (for a total of only 3 cups of flour). They baked perfectly and taste absolutely AMAZING. Thank you for this recipe which will become my cookie go to! I’m so glad it worked well for you Megan! Thanks so much for letting everyone know how it works with a hand mixer. Very useful info! Hello and thank you for this wonderful site and your cookie information. I’m going to make these cookies with my grandson. He has an airplane cookie cutter so we’re looking forward to using your recipe. One question please. Do you dip your cutter in flour or cornstarch when you’re cutting out a lot of cookies? Hey Joan! Thanks for the note! It makes me smile to think of you and your grandson making airplane cookies together. To answer your question, yes I sometimes do if the dough is sticky. But with this recipe, it rarely is. Hope that’s helpful! Have fun! Dear Allie, I am grateful for your post/blog/recipe. I’m allergic to corn in any form. I can’t use cornstarch. Can I use Arrow root? Thank you. I haven’t tried that Dee; it might work! Or you could just add a little more flour, that would be fine too. Thanks for reading! The Cutout Cookies turned out beautifully! Thank you for the recipe! There was no refrigeration of dough and it rolled out perfectly. I like the taste very much. It is somewhat like a shortbread cookie, but not too sweet. With the royal icing I think it will be perfect! So happy you like them Charis! Thank you so much for the great feedback! Nailed it! I have needed a good sugar cookie recipe and this made perfect cut outs and was a delicious cookie. I want to use this dough for everything now. Rosemary biscuits?! Or just plain with jam on them! Love. Love it! So happy you had such great results Christina! Thank you for the 5-star rating! This was the perfect recipe to make my poinsettia cookies! Thanks for an excellent recipe for shortbread cookies! So happy it worked well for you BJ! Thanks so much for the 5-star review! Not a fan. Thought the dough would break my kitchenaid stand mixer. Cookies held their shape but I could taste the corn starch. I’m sorry to hear that Kathy. It is a very stiff dough and that is why it holds it’s shape so effectively. Not sure what to say about the flavor, as cornstarch is flavorless, but thanks anyway for the feedback. These turned out perfectly! And they tasted great, too! This recipe makes beautiful cookies!! These are definitely going as gifts to some friends! My second time baking cookies and this is the best recipe ever followed everything to a T and they came out perfect and tasted delicious. Thanks this is a keeper. My pleasure Kayron! So happy you’ve been pleased. Thanks so much for the 5-star rating! This came out perfect! I made them for cookie exchange party and no one could believe i made them. Ty for sharing. My first time making cookies and they were great. I did however use 3 cups of flour and raspberry and vanilla extract but the cookie was still great. Your instructions are easy for a beginner like me thanks again honey!!! Aw it’s my pleasure Lady! Thank you so much for the sweet comment and the positive review. I love that you used raspberry and vanilla together, sounds scrumptious! If one doesn’t have rolling pin rings readily available, I use a yardstick, cut in half and placed on either side of my dough for rolling. I happen to have an extra long rolling pin, but I also have have a 1″ dowel rod that I have cut into various lengths, especially one about 18″ long to go over the yard sticks giving me plenty of working space. The shorter ones I use for rolling,, stirring, flattening etc. The dowel was purchased from a big box store. I sanded it a little more smoothly, cleaned and oiled it. I use it all the time. That is such a great tip Carol! Thank you so much for sharing! Hi there! I would recommend adding the mini chips for sure. Anything other that that and you might have trouble getting them to roll out flat and cut easily. One bag should be plenty! Good luck and enjoy! Loved your notes. My daughter and I have been decorating sugar cookies every Christmas for over 25 years. I am the baker and she is the decorator. My question is this. I have tried different sugar cookie recipes but have one recipe that is really awesome…but I refrigerate the dough and after I cut the cookies out I put the cookie sheets in the refrigerator and bottom line it is a TOTAL Pain in the …you know what. I am going to try your recipe. But I might want to adapt the one I have been using which uses confectioners sugar instead of granulated. How much of the flour should I substitute with corn starch. Is there a percent or general guideline. If I understand correctly I should also get rid of baking powder/soda (can’t remember which is in the recipe). Hopefully I will LOVE your recipe and these questions are irrelevant. But thought I would ask just in case. Hey Carol! I’m so happy you’re going to try this, I think it will be way easier for you than having to chill dough on cookie sheets in your fridge. I’m not sure I can really offer specifics on this other recipe you’re asking about though. I would need to see it in order to know… sorry I can’t be more helpful there! Fabulous! Exactly what I was looking for. I’m hosting a grown up mulled wine and Xmas cookie decorating night on Saturday. Thank you! Ooh, that sounds like so much fun! Hope everyone enjoys the wine and cookies. Thanks so much for the positive review! 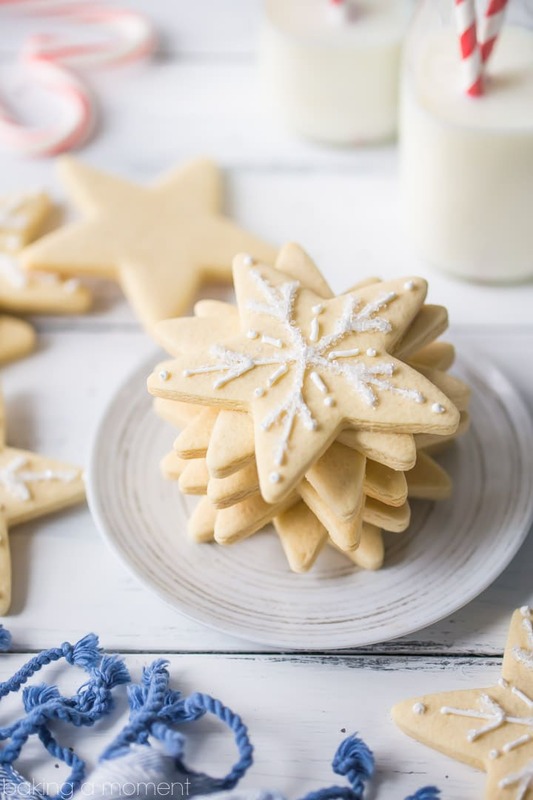 This will be my go-to sugar cookie recipe for decorating. This came out like a dream! I followed the recipe as listed, but added almond extract, which is just a preference. This recipe is forgiving and so easy to make. I love that the cookie retains the shape of the cutter (I used the state of North Carolina cookie cutter) and doesn’t spread. The texture and flavor of the cookie is exactly how I want it (tender bite and not too sweet). I know I will be turning to this recipe any time I want to decorate sugar cookies throughout the year. Thank you so much! This is such great feedback Liz, thank you so much for it! Your North Carolina cookies sound adorable! This is a fantastic recipe. I made them today with the royal icing recipe recommended. The dough was so easy to work with without refrigerating. I was so impressed with the cookie keeping its shape AND tasting delicious. I would post a picture but I don’t know how. I’m so happy you liked them Sarah! Thank you so much for your positive feedback! These are -amazing!- I used almond extract in place of vanilla, These have the sharpest edges of cookies I have ever seen & they taste brilliant too. Can’t wait to make these with the children. as they will really enjoy decorating these 🙂 thank you ! I’m so happy to hear that Sarah! I hope you and the children have so much fun with them! The only reason this recipe didn’t rate one star is because, as promised, these cookies did not spread and looked very nice. However, the texture was somewhat similar to chalk and pretty much as tasteless. These went into the garbage. That’s very unfortunate. Most of the other commenters have really loved this recipe. Made these today. We’re extremeky dry, had a cornstarch aftertaste. Sad day. Sorry to hear that Whit. Cornstarch does not have a taste- it is flavorless. There are 392 comments on this post and the overwhelming majority are from people who have been really happy with the recipe. But we all have our individual tastes I suppose! Thanks alot!!! My cookies were terrible….Now they came out great. You are a wonderful person. Thank You and have a great holiday. Thank you for your recipe!!! Was surfing the internet for the best cutout recipe to make with the kids TODAY and I knew this was awesome recipe just reading it. Will be running to the store for that cornstarch!!!! Merry Christmas!!!! That’s great Shawnee! I hope you enjoy it. Merry Christmas to you too! My pleasure Laura! Thanks so much for the 5-star rating! I was wondering how far in advance these cookies could be made? Do they keep well? Hi there Kerry! The shelf life is pretty much the same as any other cookie- a week or two in an airtight container. Hope that is helpful! Hi, this looks really good. Can’t wait to try it. One question though. In my country kosher salt is hard to find. Can I use normal sea salt? Hi, can I use sea salt instead of kosher? Kosher is hard to find where I live. Hi there! Have a look at these search results; I think you will find the answer you are looking for: https://www.google.com/search?q=kosher+salt+vs.+sea+salt&rlz=1C1CHFX_enUS602US603&oq=kosher+salt+vs.+&aqs=chrome.0.0j69i57j0l4.3617j0j7&sourceid=chrome&ie=UTF-8. Hi – Can I just say that this sugar cookie recipe is the only one that has worked for me!! Believe me, I’ve tried them all. The dough is amazing-rolls out again and again like a dream! Thank you , thank you, thank you! My pleasure Shannon! I’m so happy you like the recipe. Thank you for the positive feedback! Hello! I love love love this recipe. I’m trying to make a dairy free version. Any idea if butter flavored Frisco will work with this? I’m not familiar with the product, but as long as it is meant to substitute for butter 1:1 I think it should work! I’m a 57 yo male, and I’ve never made a homemade cookie in my life. But I’m looking forward to trying this recipe. Thank you for sharing! That’s awesome Roger! Hope you have fun baking and enjoy the cookies! Have you ever tried any of the new laser cut rolling pins on this dough? Does it work? I may need to try it with my new rolling pin. I have not tried but I do think it would work! I believe there was another reader who commented here about using a stamp and they said it worked very well. This is a PERFECT recipe for PERFECT cookies that do NOT spread at all!! Thank you SO MUCH! I’ve been baking all day! Tried several other recipes. (my gingerbread men kinda look like aliens because they spread so bad. Lol) I had to turn one batch of another recipe into the crust for plum bars because it spread too much. Then I found this recipe! Awesome! So happy you finally found it Tara! Thank you so much for the 5-star rating. And you might want to check out the gingerbread version here: https://bakingamoment.com/gingerbread-cookies-that-dont-spread-in-the-oven/. Hi. These cookies look beautiful. I am planning to try my hand at them. I’m wondering if you could take me through the process you used to decorate them. Thanks so much. Have a look at my Royal Icing post- there’s lots of info here: https://bakingamoment.com/royal-icing/. Followed the recipe to the T and very unhappy with these cookies. Not a favorite sugar cookie at my house, everyone agrees these are horrible. I will go back to my old tried and true for sure. Hi, Is the amount of cornstarch correct for this recipe? Because my dough was really dry and hard. and when baked the dough raised and it was nothing like a sugar cookie. I followed this site and tried the recipe. Incredible results is all I can say. A recipe to definitely share. I left out the leaving agent and was pleased with the precision and definition of the baked cookie!!thanknyoy! A recipe to file and a recipe to share! So glad you were pleased with it Sharon! Thanks for the awesome review! These truly are no spread cookies!! I have searched forever for a recipe like this. I have several cookie cutters with cut outs in them. I have only tried regular ones to date but am sure this recipe will work for those with cut outs. I did add some almond emulsion for flavor in a second recipe. So good either way! I am going to try the chocolate and gingerbread ones next! I also tried 3 of another cookiers recipes at the same time. They were flavored ones. After tasting them and having my family taste them all of them went right in the garbage I am sorry to say. Just by making this one recipe of yours I know that I will most likely like all of your recipes. I will be trying lots of your recipes. I can’t believe how happy I am with this cookie! Not at all Margie! I really appreciate it. I’m so happy you liked the recipe and I hope you like others here too. Thank you so much for the great feedback and for the 5-star rating! What oven setting are you using? Is it with the fan? Thanks in advance! Hey Nicci! The oven temp is stated in step one of the recipe. It’s just regular, no fan. I talk about this quite a bit in the post- how these are sturdy and suitable for shipping. Love this recipe!! First I’ve used in 25 plus years of baking that kept their beautiful shape. The family loved the taste and texture. Thank you for perfecting the technique and sharing with us! It’s my pleasure Tina! I’m so happy you and your family enjoyed! Is there a reason the vanilla bean paste gets added after the dough has come together instead of after the creaming process and just before adding the flour?? Hey Roseanne! Honestly you could add it at either time. It doesn’t really make a whole lot of difference. Hope you enjoy the cookies! I used your cookie recipe they looked really good but the tast wasn’t really sweet like a sugar cookie. Do you think of I cut the corn starch in half? Do you think that will work? Hey Stephanie! You are right this cookie is a bit less sweet- it’s because it’s meant to be frosted or iced. I typically top them with royal icing and that really balances everything out in a nice way. But if you want to eat them plain and you crave a little more sweetness, you can add a little more sugar. Just be aware that sugar tends to make things brown a little faster and be a little less soft. Hope this info is helpful! Please click the “Metric” button below the list of ingredients. Thank you! Thank you, thank you a million times thank you. I have been making cookies for a few years and have been so envious of other bakers who’s cookies always have perfect sharp edges. Finally, I too can have perfect edges on my cookies. Yahoo! I want to try these…they look great, but I have a couple of questions. Did you also use cold eggs in these cookies? Using cold butter, does it mix well with the sugar (and how long does that take)? I do have a kitchen aid stand mixer, so I’m sure it’s probably fine but I just don’t want to waste any of the ingredients and it NOT work for me. Thank you. Hey there! You can use cold or room temp eggs. It takes a minute or two for the butter and sugar to combine. Good luck! Question: what speed are you using to mix your sugar and butter? And about how long does it take to mix? I roll all my cookies 3/8″ thick. Will this recipe work for that? Thank you. Can’t wait to try your recipe. It will work, just keep an eye on bake time- they may take a bit longer since they’re thicker. I mix on medium-low to medium speed, the idea is just not to whip in too much air. As soon as the butter and sugar look smooth & all the lumps are gone, you should be good to go on to the next step. Good luck! Hi! I can’t say for sure about the tapioca, I haven’t tried that. But yes these can be used for Linzer cookies- the recipe can be found here: https://bakingamoment.com/raspberry-linzer-cookies/. Good luck! Thank you so much! Will be making these soon! Great, EASY recipe. Cookies came out perfect. Thank you! So glad to hear it! Thanks for the positive feedback! I’ve been a fan of cornstarch in shortbread cookies for a long time and have been trying to find a good roll out recipe. I only bake by weight… I was so upset that they did not turn out at all, but then I double checked the amounts. Yikes. Are you aware your metric conversions are really, really, really off? I adjusted the metric recipe to reflect the measured amounts, which is about 200g less dry ingredients than listed, and they turned out much better. It was extremely disappointing to have such an inaccurate metric recipe and waste so much on that first attempt. 😕 I hope others see this and convert the recipe themselves and not use the button on here. Hi!!! Love the recipe!! I saw that you mentioned gluten free flour. Do you have tips to make them gf? I’ve just been subbing bob’s red mill cup for cup but would love if you had any other ideas? I think what you’re doing is perfect! Those types of flour blends usually work really well. Good luck! I printed this recipe out a couple years ago from this web site, and it listed at that time 4 cups flour and 3/4 cup cornstarch. It seems to work that way. Please advise if you have since changed the recipe and if this version above works better. Thank you. great video and easy to understand. However, I used this recipe for stamped cookies with patterns on the top and the pattern came out partially melted . What do you think went wrong? Should I bake the cookies in low temperature for longer instead? Thanks. Hey Jessica, so sorry you had trouble! I feel like there was another commenter here that did the same thing but had a good result… or maybe that was on the chocolate version. Anyhow, I don’t think it would be a good idea to lower the oven temp. If anything you might want to raise it. It might also be helpful if you chill the cookies after they’ve been stamped. About 20-30 minutes in the fridge or freezer would probably do the trick. Good luck! I must have done something wrong! This dough never gathered itself into a ball. I ended up adding about 5 cups of flour + the corn starch and they truned out hard and bland. I’ve got a question. I make them with cream cheese and tartar but I’m planning on using cornstarch to make them hold their shape. If I do, would I have to substitute any of the above ingredients? Hi I want to use your recipe for my daughters wedding favours . I am using a dove cutter and applying a fondant white overlay . They will be bagged and tied with ribbon . How long before the day can I bake them and still have them taste freash . Was going to bake them on the Wednesday for the Saturday wedding ? I think that should be just fine Susan. Good luck and congratulations! Oh my god. Thank you, thank you!!!! These are exactly what I was going for. I made a half recipe to test it and it works! Gorgeous! So glad to hear it! Thanks for the 5-star rating! FINALLY!!! An awesome cut out cookie recipe that doesn’t spread!!! Plus, so easy to roll, and I love the texture, and also taste very good!! It’s a keeper, ajond I thank you very much!!! That’s so great to hear! Thanks for the great feedback Joan!